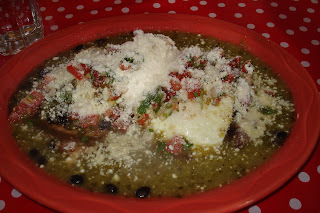 Masa cakes with fried eggs, salsa verde, sour cream, cheese and black beans. After this meal you can pretty much skip lunch! This looks a tad boring but the sandwich contains eggs, bacon and really sharp cheddar cheese. 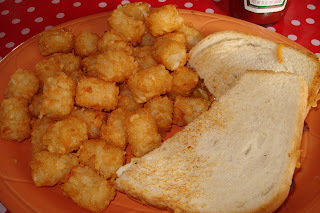 PLUS, tator tots on the side for breakfast - for cryin' out loud! It's best to drag your lazy self out of bed early on a weekend to get in line for Señor Moose . Those in the know are probably already lined up before you giving you ample time to wait and smell the coffee - no pun intended - and also think about your order. I have to say all the items I've tried are "no fail" (delicious!) especially if you like a more authentic Mexican dish rather than the ordinary melting-pot spin. Ok, I admit, the egg sandwich didn't fall into the ethnic category but I figured if Señor Moose can make most of their dishes taste great, why not a basic sandwich? If it's what you crave - ORDER it because you really can't go wrong in this place.